This is the summary of the School Committee meeting held on Tuesday, April 10, 2018. Acknowledgement of the tragic passing of FHS senior Jack Sewell and support for students available. Work on the high school field concession stand will begin soon and appropriate preparation are being taken to minimize disruption. Superintendent Ahern distributed a letter to the community later in the week and that letter was shared here. 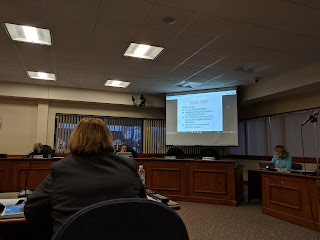 In the Discussion - Action section of the meeting, the School Committee formally approved the budget for Fiscal Year 2019. The budget is scheduled for review by the Finance Committee (6:00 PM - Apr 24) before going to the Town Council for their cursory hearings and vote. Dr Joyce Edwards presented an update on STEM and digital learning. The presentation copy is shared here. Photos of the presentation pages can be found on the live reported notes below. An update on School Safety was presented. Franklin Police Sgt. Mark Manocchio joined Peter light and Sara Ahern for this presentation and discussion. The presentation and discussion focus on the overall process. It was (as most security discussions are right to be) light on details. The coordination and collaboration of the many parties is good. They also conduct a review and make adjustments after each incident. This is as much as can reasonably be expected for a public forum. Revealing more than this is not a good practice.